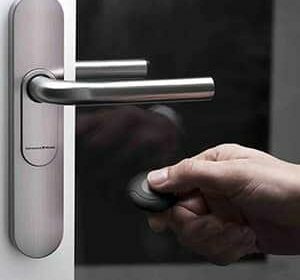 Door Access control products range from electronic code locks to company-wide access control systems integrated with other security and building automation functions. Our access control products have an enviable reputation being easy to operate whilst their robustness and modularity ensures long trouble-free life. We have installed hundreds of systems into Educational Facilities, Hospitals, Office Buildings, Blocks of Flats to name but a few. Restricting access onto a site or into a building is key to reducing security breaches during working hours and maintaining control out of hours. All systems will be installed to comply to NACP30 and BS EN50133 in keeping with our N.S.I. (NACOSS) Gold Accreditation. From a simple audio single button call unit on the outside of a building calling through to a handset in reception to allow two way speech and door release, to multi-door and multi-handset/station systems and video to allow a camera view of the caller for enhanced security. Many different designs and finishes ensure a design to suit both application and environment. For the more sophisticated application a Door Access System can be designed to suit with solutions that are flexible enough to meet your requirements, whilst allowing for systems to be expanded or upgraded at a later date. Ease of use once installed ensures the system will be a major tool in enhancing your building management. 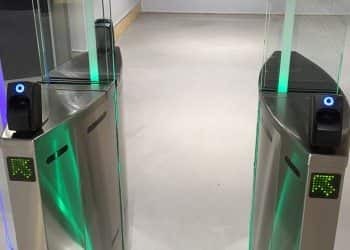 We can design a system capable of handling 1 to 40,000 card holders, future proofed components, mirrored databases and Ethernet connection in an IP environment. A multi-functional, multi-site system that has all the features you expect and more. Analogue and IP systems available. 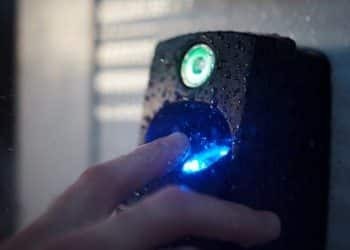 With biometric readers becoming more affordable we can offer a range of finger print readers, finger print and PIN, finger print and prox readers. Biometrics identifies the individual rather than the credential by way of identifying a unique human characteristic. We are able to integrate a number of systems to work with each other enhancing your security and making building management more efficient therefore saving time and money. Systems can compliment one another for example having a Personal Attack Button pressed on an Intruder Alarm will create immediate Police response. False Alarms will lose Police response. Having a CCTV camera overlooking the PAB can give confirmation to an Alarm Receiving Centre whether a genuine alarm or not. A CCTV camera overlooking a door so when a Door Access reader is activated it takes a snap shot of the person entering. 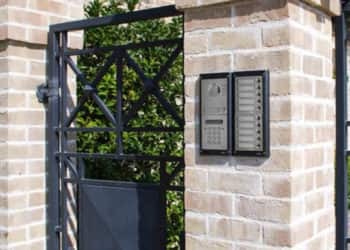 Door Access integration with automated gate or barrier systems with CCTV Automatic Number Plate Recognition or overview cameras. There are many applications and with technology all colliding it is now much easier to achieve a fully integrated security system. We are available to give FREE no obligation quotes, just call our team on 01296 713010, email enquiries@oakparkalarms.com or fill out our ‘Get In Touch’ form and we will be straight back to you.